Many talk about determination yet they cannot describe what it looks like. The kind of progress Iced technologies are making with their innovations in agribusiness is one never seen before. Everyone should see what Iced technologies are doing in the field of agribusiness, the mountains they are moving with their amazing innovations and the undying spirit and desire they have to see young people trained on the use of mobile smartphones to document and as Jackson Kiptanui, the founder of IcedTube (IcedTv, IcedYoung and IcedFarmer) says, ‘democratize agribusiness’. And it is not only about the young, it is about food security for the IcedYoung is just one among other Iced initiatives. Really, how easily can one disseminate information in this age other than use mobile gadgets, what Mobile Journalism Africa calls ‘pocket studios’? Or perhaps, who in this age isn’t as close to their smartphone? Better still, how easy can it be for one to access agribusiness content other than through their phones? And what if this content is documented and shared out among farmers and aspiring agripreneurs? The progress Iced technologies is making is nothing short of wonderful. Jackson Kiptanui, the CEO and founder of IcedTube is devoted to ensuring that farmers access information that will be instrumental in their development cheaply, faster and easily. His ultimate goal remains food security which is a major pillar in a country’s development. Just one week after marking the first anniversary, a representative team of Mobile Journalism Africa and IcedTube CEO and founder, Jackson Kiptanui hit the road on the 25th January to Egerton University, Njoro to conduct yet another training on the use of mobile smartphones in shooting and editing of agribusiness content. This was in partnership with CoELIB media. 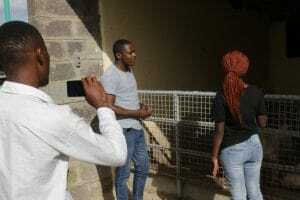 This training of aspiring agripreneurs proved different from the one which was conducted on the 23rd November, 2018 when Iced technologies-which comprises of IcedTube, IcedTv, IcedFarmer and IcedYoung- had gone to Egerton University then to launched its first chapter of IcedYoung club. Afterwards, everyone returned to CoELIB incubar for the second session. This session involved the editing of these videos into quality, consumable pieces. The IcedYoung club currently has 35 members. Interestingly enough, these members are from different faculties, serving to explain the kind of reception the project is getting. These club members meet twice every month in what they have dubbed IcedTube Chats. Additionally, it’s not just about the members meeting. 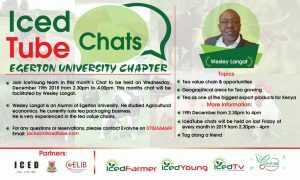 At each chat, there is a speaker who gives a talk on agribusiness. “We are planning this year to launch the ‘My community Our Community initiative’ remarked Jackson. The initiative is set to diagnose challenges that farmers face. It is IcedYoung members who will, through their interaction with farmers, establish these problems. Through the chats, they will asses these problems and prescribe solutions. “The aim of this project is to empower smallholder farmers at community level,” concluded Jackson. The long awaited IcedTv is also set to be launched next week. This channel will be broadcasting agribusiness content. In addition, academia and their research will be broadcast, bringing them closer to the agribusiness community. Who still doubts that this is the future of agribusiness? Really, what defines progress and innovation? At Iced technologies, technology is being harnessed in the best way possible.